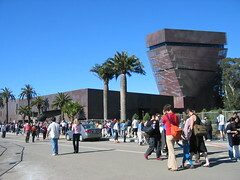 Today was the second day of the grand opening celebration at the de Young Museum, and it was in full swing. Ben and I planned to meet at 10 AM, but when I got there, I found no parking within the park and settled for the new parking garage underneath the Music Concourse. It ended up being $15 for 4 hours — painful, but worth not circling the park for an hour. Then I got in line, which at the time stretched from the museum entrance all the way out to 8th Ave and JFK Drive, about 200 yards. A volunteer guessed it would take about 1½ hours, but it ended up being “only” 45 minutes, and granted, the line moved faster than I expected. 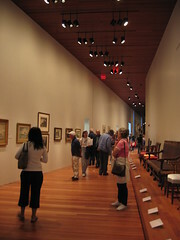 A ubiquitous city is where all major information systems (residential, medical, business, governmental and the like) share data, and computers are built into the houses, streets and office buildings. New Songdo, located on a man-made island of nearly 1,500 acres off the Incheon coast about 40 miles from Seoul, is rising from the ground up as a U-city. Sounds like a ubicomp researcher’s dream. The Los Angeles area is the most densely populated metropolitan area in the country. Surprise! San Francisco/Oakland and San Jose are #2 and #3. (Why they are counted separately, I don’t know.) New York/Newark (which also includes parts of Connecticut) is #4. A climatologist says that sprawl in Dublin, Ireland has resulted in its average temperature increasing less over the past three decades than other European cities. If only more city governments would do this: hire architects based on the quality of their work instead of the competitiveness of their bids. The malls in Cupertino and Sunnyvale have been in the dumps for a decade, with promises of redevelopment come and loseWeight Exercises Vallco – 2003″ href=”http://sanjose.bizjournals.com/sanjose/stories/2003/06/09/daily55.html”>gone, over and over. But things are finally moving. The owners of Vallco Fashion Park in Cupertino have recently started a major renovation and expansion project, including a new movie theater. (Maybe we can finally get a decent bookstore…) It will look a lot more like a traditional commercial district. There is also a new mixed-use development being built near the city hall and new library, and there are plans for a new downtown at the Crossroads, the old center of town. Meanwhile, the owners of Sunnyvale Town Center will start demolition of the old parking garage next week, and of the mall itself next year. In fact, the mall, which replaced the old downtown, is being replaced with a new downtown, complete with a replica of the old city hall. (Take a look at the nifty video.) It will also include a new movie theater — how many more can this area take? Now if only Santa Clara can finish a plan to replace the downtown that it tore down for a mall that never came… By the way, the only reason Mountain View still has its downtown along Castro Street is because it ran out of money to mess with it back in the 1970s. The latest issue of National Geographic has a great article on Frederick Law Olmsted, an amazingly prolific landscape architect best known for designing Central Park with his partner, Calbert Vaux. Not mentioned in the article is his Bay Area work. For example, he drew up the first campus plan for UC Berkeley in 1866, which established the basic orientation the campus has to this day. And his 1888 master plan for Stanford is once again guiding new construction, most notably the Hewlett and Packard Quad (formerly the Science and Engineering Quad) and its sequel, SEQ 2.